Cars. Nearly every private car and lorry in the Colony was collected by the Japanese before the end of January and parked in the Cricket Club Grounds or on the race course I understood that the engines were to be removed and sent to Japan. Most of the private cars and taxis were originally concentrated on the Race Course, the Hongkong Cricket Club and the Kowloon Police Recreation Club grounds and then reportedly shipped to Japan. The general policy of the Japanese up to date has been to take away and ship all raw materials, engines and food. Dockyard has been stripped. 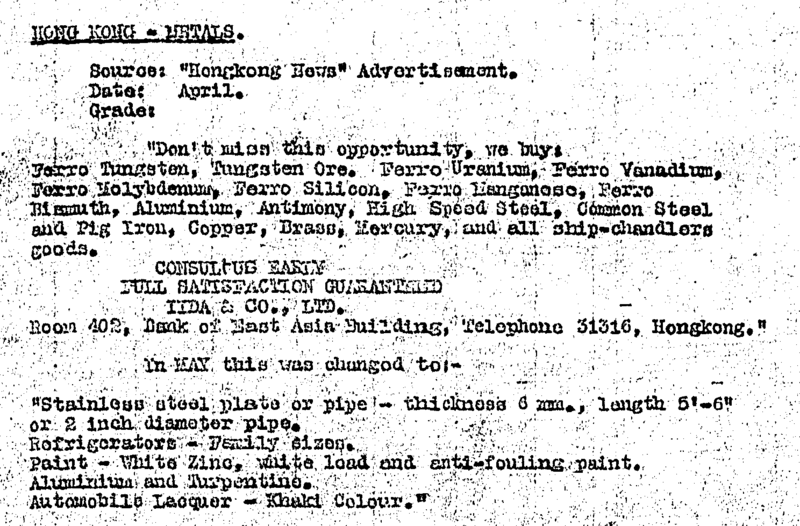 All scrap iron has been exported but steel supplies are stored in the Naval Dockyard. All British Army wireless sets from “Ridge” stores such as Wireless Sets No 1 complete pack and No 9 sets, wavemeters and all accessories shipped in early February. 20 large drums of lead covered cable have recently been exported. ‘200 sacks of scrap iron, 900 light machine guns loaded on to Tai Tung Maru. The policy of the Japanese seems to be the exploitation of the colony’s resources while endeavouring to “sell” the Greater East Asia Co-prosperity Sphere to the local people. 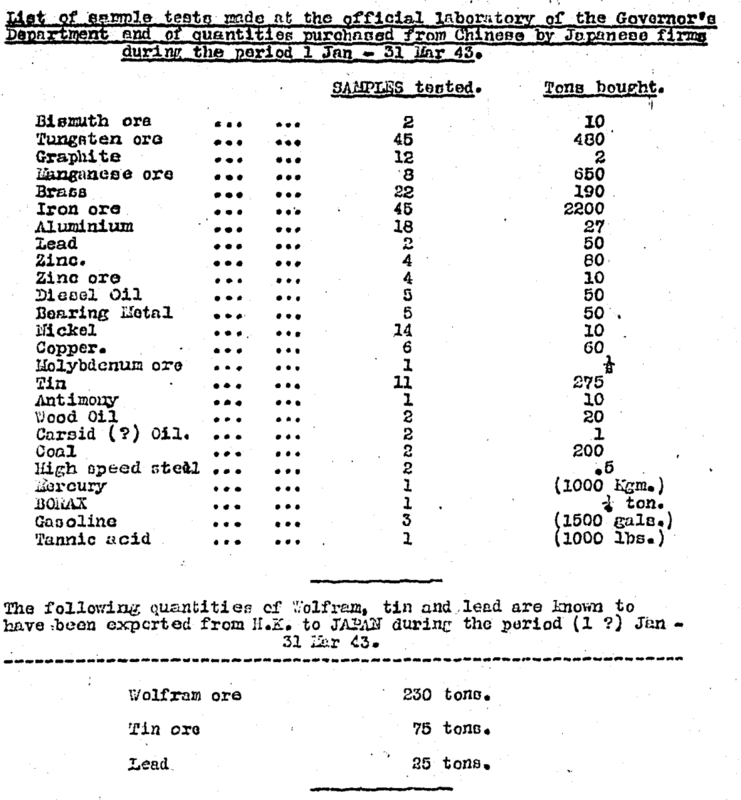 Owing to the fact that immediately after the fall of Hongkong the Japanese shipped away to Japan and Hainan all existing stocks of raw materials, there is now an acute shortage and the Japanese are feverishly seeking out small remaining stocks of Pig Iron, Copper, Wolfram and Wax. Cotton yarn is bartered by the Japanese for Wolfram, Wood, Oil and Rice, which are smuggled out from China. They also barter opium for these commodities. From all reliable sources comes the information that the Japanese are getting as much material out of Hongkong as they can and sending to Japan and Formosa. This is confirmed by 68 who has a friend in Taiwan Transportation Co.
68 reports that `previously the Japanese used trawlers; now however they are using transports of about 2000 tons. These ships, he states, proceed to Indo-China with troops and war materials and return with rice to Hongkong where they load materials for Japan. New B&S ship “Wing Sang” raised and seen loading Wolfram on the 6th February, destination believed Japan. The ship was not expected to leave immediately. (source – Hyde). All available stocks of scrap iron in Hongkong are being shipped to Japan. At least 3 Transports seen late in February in HK Harbour were fully loaded with Iron and waiting to leave for Japan. Scrap includes all metals taken from houses demolished in Kowloon City under the Kai Tak Aerodrome extension scheme. Old HK or NC nickle coins are in great demand by the Japanese. Prices are $1.75 Silver and $1.00 nickle for Military use. All printing machinery and accessories formerly in Central Police Station have been removed to Japan. Two of the latest model fire engines are being prepared for shipment to Japan, two Chinese Superintendents of Fire Brigade being ordered to accompany them. M Group have just submitted data re Japanese tests and purchase of certain minerals and metals. This information forms Appendix ‘A’ to this sub-division. The source is an M Group operative who is employed in the official laboratory of the Governor´s Department. Aluminium scrap is being assiduously collected – screw caps from bottles, shaving scrap holders etc. “A large quantity” of old Hongkong nickel coins are stored in Ford godowns at Taikoktsui. Two reports from M Group state respectively a) Only 200 cars are left on the Pehei Sports Ground, Boundary Street, Kowloon, the remainder having been melted for scrap; b) All cars parked on the Police Recreation Club grounds, Boundary Street, Kowloon, are being scrapped after removal of engines. It is not clear whether these reports refer to the same place or not. Ore mines at Linmahang and Ngtungshan have been re-worked since last November. 200 men are now employed there. The two new fire-engines which arrived in Hongkong shortly before hostilities were shipped to Japan 15 or 16 April 1943. A report just in from 71 states the Iron Mine at Ma On Shan has been re-opened. Steam-lighter “Cheong Ming” left for mine 15 April to carry ore back to Hongkong. Wolfram is being mined in the Shing Mun (Jubilee) Reservoir. A Formosan firm on the spot is buying the ore as mined. Work in both mines is not at full capacity owing toshortage of tools. Orders hgave been placed with local Chinese firms for shovels. Manganese Ore formerly owned by the Kwangsi Provincial Bank and stored in godowns at Mongkok has been loaded into lighters in Yaumati Typhoon Shelter awaiting shipment. Kweilin Weekly Intelligence Summary #1 Tungsten, uranium, vanadium, molybdenum, silicon, manganese, bismuth, aluminium, antimony, steel, iron, brass, mercury. KWIZ #4 27.6.43 Iron, brass, tin. This article was first posted on 29th May 2015.